High Representative of the European Union for Foreign Affairs and Security Policy Mogherini arrived here Saturday morning. 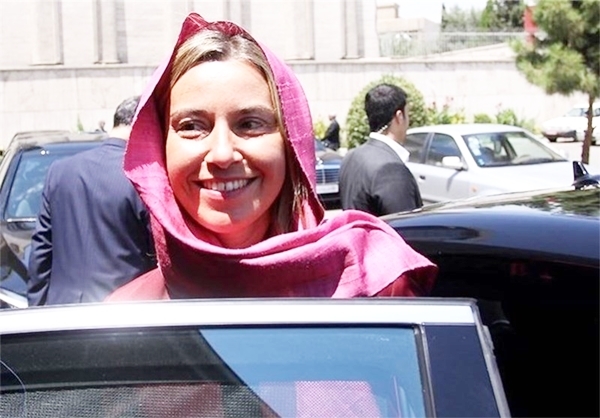 Mogherini arrived in Tehran on Saturday, heading a high-ranking diplomatic-economic delegation consisting of seven EU commissioners in the fields of energy, scientific research, environment, sports and industry. Mogherini is due to hold talks with senior Iranian officials during her one-day visit. She plans to meet with Iranian Foreign Minister Mohammad Javad Zarif, Parliament Speaker Ali Larijani and Secretary of Supreme National Security Council Ali Shamkhani. EU foreign policy chief is accompanied by seven EU commissioners and plans to discuss expanding trade ties between Iran and the EU and removing obstacles on opening an EU office in Tehran. Mogherini and Zarif are expected to sign a statement and some agreements on oil and energy. Mogherini would leave Tehran on Saturday but a number of EU commissioners would stay in Tehran for further talks.